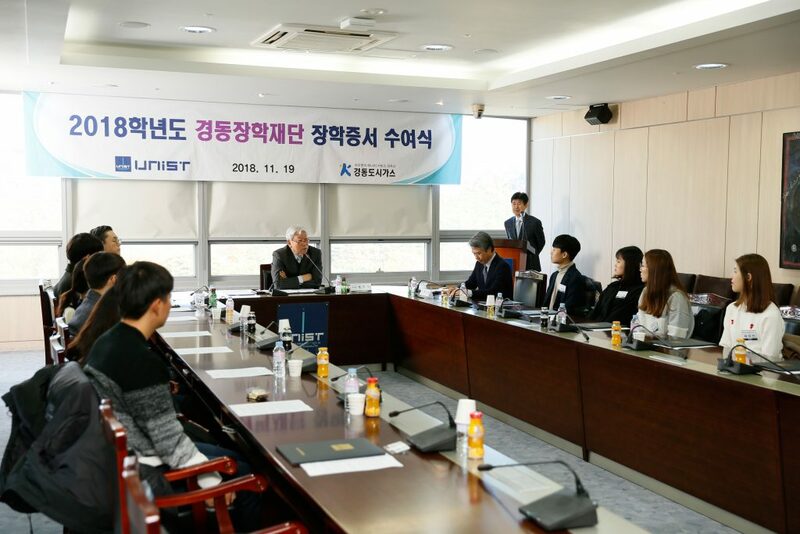 The 2018 Kyungdong Scholarship award ceremony was held at UNIST on November 19, 2018. 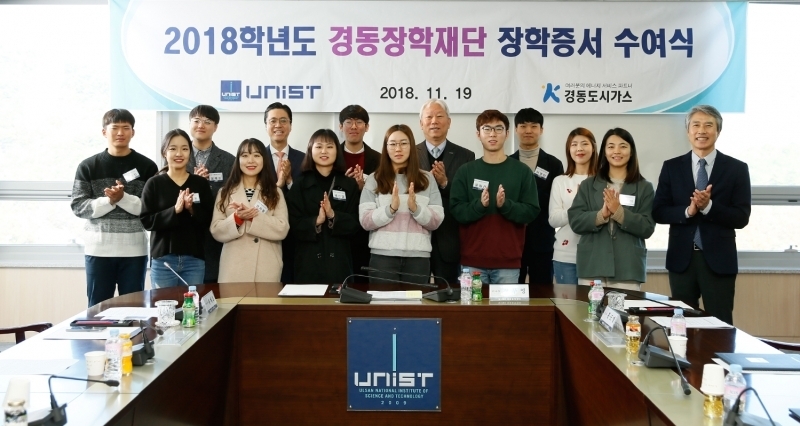 On November 19, UNIST held its annual Kyungdong Scholarship award presentation and ceremony to recognize and reward students who have demonstrated outstanding academic achievement. This year, the Kyungdong Scholarship Foundation has selected 11 deserving students to receive the 2018 Kyungdong Scholarship and each recipient has been awarded with a certificate. As part of this scholarship, the recipients will gain internship experience where they will develop a global mindset to better prepare themselves for the globalization challenge. Kyungdong Scholarship Foundation has launched a scholarship program, namely ‘UNIST-Kyungdong Global Scholarship (UKGS) Program’ with an aim to foster global talents of UNIST. Launched in 2017, this scholarship program hard working students at UNIST with financial support to extend their talents and pursue their academic aspirations. It also provides a wide variety of opportunities for exchanges and internships with some of the world’s leading institutes, such as Harvard University in U.S and McGill University in Canada. The 2018 Kyungdong Scholarship awards presentation ceremony was held at 6F conference room of Main Admin. Bldg. at UNIST on November 19, 2018. The newly-awarded recipients will start an internship at the Canadian government recommended startups, while studying at McGill University in Winter. Through this six-month internship program, students will gain invaluable global experience in a variety of areas, including IT, energy, and environment. The other five recipients have already completed the four-week research internship via the UNIST-Harvard SEAS Summer Exchange Program in July this year. They spent two weeks each at Harvard and UNIST and learn about core research strengths of each university and to promote cultural exchanges. 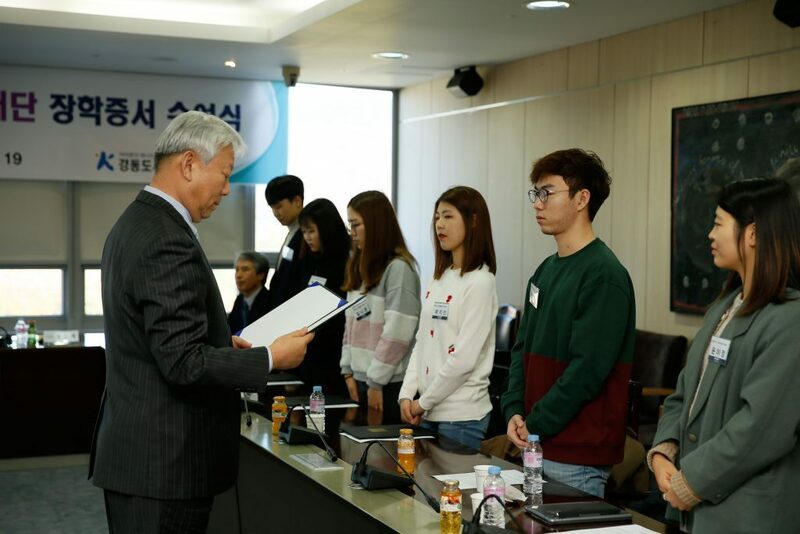 President Mooyoung Jung of UNIST presents certificates to the recipients of 2018 Kyungdong Scholarship Foundation. “I am delighted to present the scholarships to these outstanding individuals in recognition of their academic talents,” says President Mooyoung Jung of UNIST. The Kyungdong Scholarship Foundation was established in 2007 as part of corporate social responsibility activities of Kyungdong City Gas Co. Ltd., the representative energy company of Ulsan city. As of 2018, a total of 129 students were granted scholarships to pursue their academic aspirations. The 2018 Kyungdong Scholarship award ceremony has been attended by UNIST President Mooyoung Jung (Chairman of Kyungdong Scholarship Foundation), CEO Jae-Ho Song of Kyungdong City Gas Co. Ltd. (Director of Kyungdong Scholarship Foundation), CEO GeunMyung Hong of Tax Services Corp. Isan (Auditor of Kyungdong Scholarship Foundation), and other related guests.